The 2011 Scripting Games begin on April 4, 2011, and run through April 15, 2011. The Scripting Games are the premier learning event of the year for IT pros and others who want to master Windows PowerShell. For each of 10 events, you as a registered contestant have seven days to script a solution to a scenario-driven problem and post your code to an MVP-maintained script repository. A panel of internationally recognized judges scores each script you submit. And daily leaderboards and prize drawings help keep your interest high throughout the two-week international, online event. Last year, people from more than 200 countries visited the Script Center during the Scripting Games. Because the scripts are written for real-world scenarios and problems, they are of immediate value to everyone, participants and spectators alike. 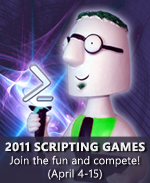 Register by signing in to the 2011 Scripting Games page at PoshCode. Fill in your account info. Please see the blog that explains how the Scripting Wife registers. Events begin on April 4, 2011 and are displayed on Hey Scripting Guy! blog. Submit your entries at PoshCode on the contribute page. Coming May 2, 2011, after conclusion of Expert Solutions. Coming April 11, 2011, after the first entries are submitted. Coming April 18, 2011, after all entries have been submitted. Check out the prize list and randomly drawn prize winners. New drawings held daily during the Games. The Scripting Wife begins her 2011 Scripting Games prep work March 7, 2011. Check out her daily beginner Scripting Games event commentaries.